Monday, January 13, 1913: Nothing much for today. Something must have happened a hundred years ago today. I wonder what the Muffly’s ate on that mid-January day. The dishes they ate probably were made with local ingredients that were available in January. I’ve been enjoying trying old fritter recipes, and have warm, fuzzy, memories of eating apple fritters on cold winter days. Combine flour, baking powder, salt, sugar, egg, and milk. Beat until smooth. Stir in apples. Heat shortening until hot in large frying pan. Drop spoonfuls of batter into hot shortening. Flip fritters and fry until golden brown on all sides. 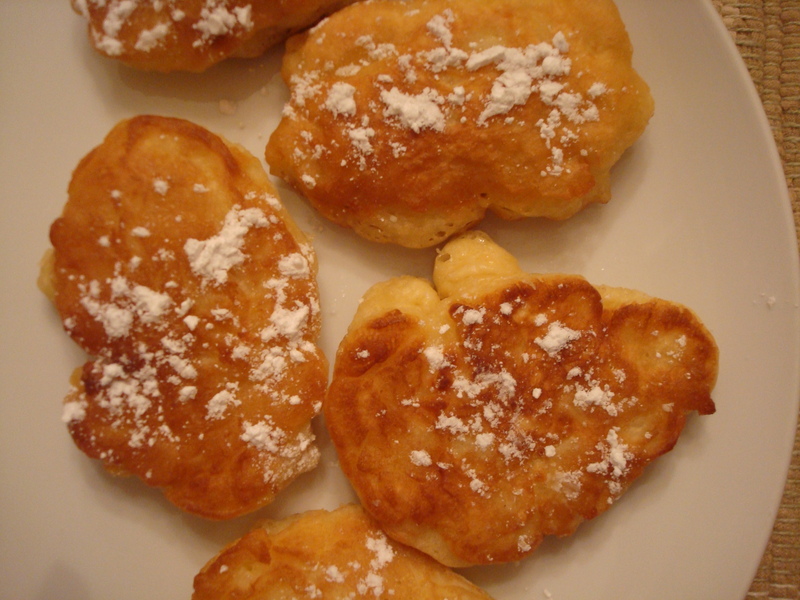 The fritters may need to be flipped several times to completely cook due to the thickness of the batter. Posted on January 13, 2013 August 30, 2015 by SherylPosted in Food, recipesTagged apple, desserts, fritters. Previous Previous post: What’s the Difference Between a Recitation and a Dialogue? They really sound good. Now I have to have a snack before bed :-). oh man, yum. I’m trying to be really good after Christmas. Since I have absolutely no willpower, I will have to refrain….urg. Why can’t we eat like we did in our 20’s? Thanks for sharing: I was looking for an old-fashioned one of those. Gosh, that recipe looks so good.I’ll save it for a special morning breakfast! Yum! So many great foods we are starting to forget! I love apple fritters but have never made them. Maybe I will try this recipe. LOVE apple fritters – will try your recipe soon! apples cut in small pieces .